I just found this site, thanks! The other XR forum got destroyed by spammers. 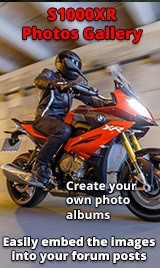 I ride a 16 S1000XR. Best bike I have ever owned! I love this thing. I’m glad to have found this site. Ride safe. Hello Big Dog and welcome to the forum. The XR is quiet the bike. Hello big dog, welcome to the forum. By Lake Country you mean Where? There are lakes absolutely everywhere in Canada! Lake Country is a city just north of Kelowna. Provence of BC. Awesome, stayed 2 nights in Kelowna last July. I'm in Toronto, I wonder any other riders in Toronto or surrounding areas?